From the BEA, a disappointing first estimate of first quarter GDP: they have the annualized growth rate at a mere 0.2%. Consumption, the largest part of GDP, was a bit stronger at 1.9%, but government purchases were a drag, falling at a -0.8% rate. The strong dollar helped reduce net exports; exports fell at a 7.2% rate. Another worrying note is that there was a substantial positive contribution from inventories - while this adds to GDP, it also means a greater stock of unsold goods which could lead firms to cut back production in the future. 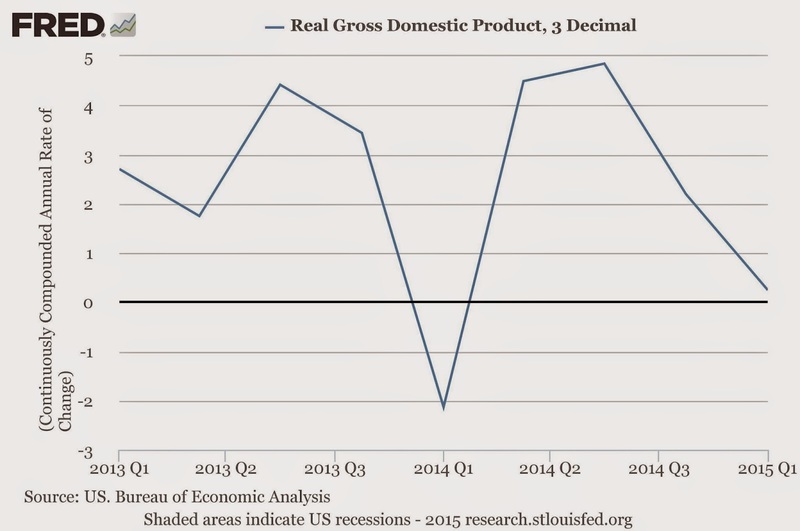 This isn't the first time in recent memory that first quarter GDP has seemed weak. As Justin Wolfers notes, it seems like something may be off with the seasonal adjustment (i.e., the government attempts to take out the normal seasonal patterns, like the decline in retail after the holidays). While the seasonal adjustment should take into account typical effects of weather, White House economic advisor Jason Furman notes that this winter was harsher than usual. Another major indicator of economic activity is growth in payrolls, which averaged a reasonably healthy 197,000 during the first three months of the year. So I don't think the GDP estimate - which is, as always, subject to substantial revision anyway - is cause for panic, but it is a cautionary signal to the Fed as it contemplates when to start raising the federal funds rate target. So make no mistake: graduate school is no picnic. Yes, there are modest financial rewards. But unless you’re one of those people who absolutely loves being a scholar, you’re probably going to pay heavy costs in terms of your lifestyle and mental state. These are things I wish I had known about before I did my own Ph.D. Think twice before jumping on the grad school train. I think "modest" may overstate the financial rewards. Conditions vary widely by discipline, so its hard to generalize. My own advice - tailored to economics - is here. that's the headline on this Wesleying post by econ major Kerry Nix '16 (and in the post there is a link to a longer report that is well worth reading). Overall, as the report notes, about 25-30-ish percent of Economics students at Wesleyan are female; this is pretty consistent with national averages. So, its not just us, but that doesn't mean that we can't do some things locally. There is quite a bit of concern about whether the atmosphere in classrooms with a relatively large number of students and a lopsided gender ratio is particularly off-putting to women. I think this is plausible, though this is one of several concerns where it might be helpful to have some survey research to back up (or not!) our anecdotal impressions. Many of our classes rely primarily on lecture-based pedagogy; there are some suggestions in the report that other approaches - e.g., in-class problem-solving or inverted classrooms - might be more appealing to female students. In this regard, at present, I think the situation at Wesleyan is that we're very constrained by class size: our enrollments (and majors) per FTE are among the highest in the university. While the size of the department has increased slightly, it hasn't remotely kept up with the growth in enrollments. What that means is that our sections of Econ 110 (our intro class for majors) typically have 40-50 students; sections of the lower-level electives and the core intermediate sequence for majors have enrollment caps of 35 (and are very often at or near this cap); it is only the upper-level electives that could be considered "small," and even these have 25 students per class. While these numbers don't seem high in the universe of American higher education overall, this is in the context of an institution where 72% of class sections have an enrollment of 19 or fewer and where many of the incoming students have chosen a liberal arts college with the expectation of small classes. In a large class, it will be inherently less comfortable for most to participate and ask questions and the report suggests this might disproportionately affect female students (though I think it's a concern for everyone). As instructors, it also limits our pedagogy, and the preponderance of lecturing in economics is partly a reflection of our class sizes. I have been able to integrate some in-class problem solving in Econ 270 (a lower-level international economics elective) and Econ 110. In Econ 302 (the core macroeconomics course), I experimented with an inverted classroom in the fall; I think it went quite well, but I happened to have a section with a smaller enrollment - I doubt it will be as successful when (if) I have a more typical enrollment of 35. Another issue raised is the mathematical intensity of our curriculum and how this might interact with lower levels of mathematical confidence in female students. As a factual matter, I don't think a confidence differential is warranted; there's no lack of math ability in the women coming into our classes - this is true both relative to men and in an absolute sense. However, I suppose stereotypes that mathematical stuff is "hard" and "softer" topics are better suited to women are deeply embedded in the broader culture - hopefully fading over time, but not quickly enough. Overall, I believe the mathematical rigor of our program is a strong suit - Wesleyan is very unusual in utilizing calculus from the outset (Econ 110). One of the most valuable things that students take away from studying economics is the habits of mind - i.e., a particular type of critical thinking - that come from the discipline imposed by thinking in terms of models, expressed and manipulated in mathematical language. Moreover, economics as it is practiced is a very mathematical discipline - while some may not like this (and I was a very math-averse economics undergraduate myself at one point) - I think our introductory class more honestly represents what studying economics involves than the more typical style of university "principles" courses which try to minimize using math. I'm not sure this is gender-specific; as an instructor, I need to guide my students through the theory - this is, for most, the hardest part, and where they most need the help of a professor (one of the reasons I majored in economics was that I perceived I needed this as a student). We're time-constrained in class, but I've tried to use reading assignments to enhance students' sense of how the theory applies. Over the course of the curriculum, the students learn about how we test theory against data and develop an understanding of how we choose which models (and therefore what simplifications) are appropriate under alternative circumstances. But this all rests on groundwork we build in the introductory class and I think it is worth thinking about whether there might be changes we could make in its structure that could address some of these concerns. The report also mentions grades, citing Claudia Goldin's research that women are more likely then men to be put off further study by low grades in introductory classes (summarized in this Washington Post column by Catherine Rampell, which I discussed in an recent post). Economics does have one of the lowest grade point averages at Wesleyan - our grades are inflated, but less so than those in most other departments. I think this is a serious issue - this effort at Wellesley to impose common grading standards demonstrated how much grading differentials across departments distort students' choices. To the extent that women's choices are more affected then men's, grade inflation is a gender equity issue. However, I think the culprit is not the economics department, but others where the grade inflation has gotten out of control (which I think is an unsurprising symptom of the reliance on student evaluations in promotion and tenure). Another issue raised by the report is whether men are more likely to be attracted to economics because they believe it suits their vocational goals. The misperception that an economics major is a proxy for studying business or finance runs deep. I should write more about this sometime; for now, I'll simply say that this reflects a fundamentally incorrect view of what economics is about. To the extent that this is disproportionately bringing more male students into economics, they're coming for the wrong reasons and the implication would be that "economics needs fewer men." There's quite a bit more in the report that is worth thinking about. Some of the issues are fundamentally about student culture - Wesleyan students seem to mostly be pretty good at maintaining their culture and supporting each other, so I am optimistic that the students can make progress, as well as the faculty.